HOW DO I GO ABOUT TAKING A DRIVING SAFETY COURSE TO DISMISS A VIOLATION? WHY DO I HAVE TO TAKE A DRIVING SAFETY CLASS AS PART OF A DEFERRED DISPOSITION? IF I STILL WANT TO TAKE A DRIVING SAFETY COURSE TO DISMISS MY CITATION AFTER BEING SET ON A PRE-TRIAL/TRIAL DOCKET, WILL I BE ABLE TO? WHAT DO I NEED TO DO TO GET DEFERRED DISPOSITION? WHAT IF I WAS ISSUED A CITATION FOR NOT HAVING INSURANCE, BUT I HAD A VALID INSURANCE POLICY AT THE TIME OF THE STOP? WHAT IF I GOT THE PROBLEM I WAS CITED FOR FIXED RIGHT AFTER I GOT THE TICKET? I’M NOT SURE WHAT THE TEXAS RESPONSIBILITY PROGRAM (SURCHARGE PROGRAM) IS? HOW DO I FIND OUT MORE INFORMATION? WHAT IS THE DIFFERENCE BETWEEN A TRIAL BY JUDGE AND A TRIAL BY A JURY? WHAT IF I CAN’T PAY TODAY, WILL I GO TO JAIL? HOW DO I GET JAIL CREDIT? HOW DO I GET INFORMATION ON MY SPECIFIC CASE? WILL I BE ARRESTED IF I COME INTO THE COURT TO TAKE CARE OF A WARRANT? HOW DO I KNOW IF I EVEN HAVE A WARRANT OUT FOR MY ARREST? WHAT IF I RECEIVED A VIOLATION IN THE CITY OF VIDOR BY A DPS TROOPER OR AN ORANGE COUNTY SHERIFF DEPUTY AND NOT A CITY POLICE OFFICER? MY CHILD RECEIVED A CITATION AT SCHOOL? WHICH COURT DO I NEED TO CONTACT? WHERE CAN I CHECK THE STATUS OF MY TEXAS DRIVER'S LICENSE? WHERE CAN I FIND OUT IF I HAVE BEEN ENTERED INTO THE TEXAS FAILURE TO APPEAR / FAILURE TO PAY PROGRAM? I AM 16 - 24 YEARS OF AGE AND NEVER COMPLETED DRIVER'S EDUCATION. WHAT DO I NEED TO DO IN ORDER TO APPLY FOR MY TEXAS DRIVER'S LICENSE? WHERE CAN I FIND TEXAS STATUTES? This automatically enters a plea of no contest and waives jury trial. Will result in a conviction on your driving record. Request a Driving Safety Course if eligible (see the option in the top right of this page labeled Driving Safety Course). Request a Deferred Disposition if eligible (see the option in the top right of this page labeled Deferred Disposition). Proof / Compliance Dismissals if eligible (see the option in the top right of this page labeled Compliance Dismissals). Go to Trial (see the option in the top right of this page labeled Pre-Trial/Trial). Surcharges assessed by the Texas Department of Public Safety in addition to any fine / fees paid to the Court. Increased liability insurance costs (or cancellation). You may want to perform more research or consult an attorney (Court staff cannot assist). Follow the instructions under the Driving Safety Course option in the top right of this page to see if you are eligible. Successfully complete a Deferred Disposition (if eligible). Have a case dismissed by showing appropriate proof of compliance (if eligible). Not guilty verdict at trial. You are under 25 years of age, the Judge has placed you on Deferred for a moving violation, and because of your age, State law requires you to complete the course as a condition of your Deferred. The Judge has ordered you to do so as a condition of your Deferred. This requirement will not be waived by discussion with prosecutors. No. Taking a driving safety course (defensive driving / DSC) to dismiss the charge is NOT available if you have not requested to take the course by your original appearance date or within twenty (20) days from the date the citation was issued to you, whichever is later. Deferred options will still be available to you at that time if you are eligible. Follow the instructions under the Deferred Disposition option in the top right of this page to see if you are eligible. Present to the Court a valid insurance card that reflects coverage for the date and time of the citation. You will sign a sworn affidavit swearing that the proof you are presenting was valid at the time of the stop and is not fraudulent. All insurance proof is verified with the insurance company by Court personnel. If you went out and purchased insurance after the citation was issued, the citation cannot be dismissed; however, you may request deferred disposition which, if successfully completed, will keep the no insurance citation off of your driving record. Convictions for no insurance stay on your driving record permanently. Insurance convictions on your driving record can be used to enhance subsequent no insurance violations resulting in higher penalties. No insurance convictions carry a surcharge through the Texas Department of Public Safety in the amount of $260 to $300 per year every year for three years running. This is in addition to the fine/fees you pay to the Court. Failure to pay surcharge fees to the Texas Department of Public Safety resulting from a no Insurance conviction, will result in the permanent suspension of your driver’s license by DPS until you have complied with the DPS surcharge program. Follow the instructions under the Compliance Dismissals option in the top right of this page to see if the offense you were cited for is eligible for a compliance dismissal. If you are eligible, any receipts/proof or the affidavit must be presented and the appropriate fee (if applicable) must be paid when the dismissal request is made. If you were cited for driving while license invalid (suspended license), and after receiving your citation you contacted the Texas Department of Public Safety and now hold a valid driver’s license, the citation cannot be dismissed; however, you may request deferred disposition which, if successfully completed, will keep the driving while license invalid citation off of your driving record. Driving while license invalid (DWLI) convictions on your driving record can be used to enhance subsequent DWLI violations resulting in higher penalties. An officer can arrest you for DWLI and have your vehicle towed instead of issuing you a citation at his/her discretion. DWLI convictions carry a surcharge through the Texas Department of Public Safety in the amount of $260 to $300 per year every year for three years running. This is in addition to the fine/fees you pay to the Court. Failure to pay surcharge fees to the Texas Department of Public Safety resulting from a DWLI conviction, will result in the permanent suspension of your driver’s license by DPS until you have complied with the DPS surcharge program. If you do not have access to the internet, the number given on the Texas DPS surcharge contact information page is 1-800-688-6882. They also have another number listed under the indigent information page. This number is 1-866-223-3583. Please note that the Court is not affiliated with the Texas Department of Public Safety or the driver responsibility program. We provide the information as a courtesy only and all questions about the program must be directed to the Texas Department of Public Safety. Court Personnel cannot give legal advice. A jury trial is before six (6) citizens of the City of Vidor. When you select a trial by jury, the jury will decide whether you are innocent or guilty of the offense you are charged with. They will not set the penalty unless you have filed a motion stating that you wish for the jury to assess the penalty if you are found guilty. Unless you file the motion, the Judge will set the penalty. This type of trial generally takes 2 to 3 hours. A “bench” trial is a trial before the Municipal Judge. There is no jury and the Judge will decide whether you are innocent or guilty of the offense you are charged with. The Judge will also set the penalty if you are found guilty. This type of trial generally takes 30 minutes to 2 hours. For more information on trials see the Pre-Trial/Trial option in the top right of this page. No, these cases are fine-only offenses. You are not entitled to a court appointed attorney on a case where the penalty is a fine only. You may hire an attorney to represent you or you may represent yourself. You will be prosecuted by an attorney (prosecutor). 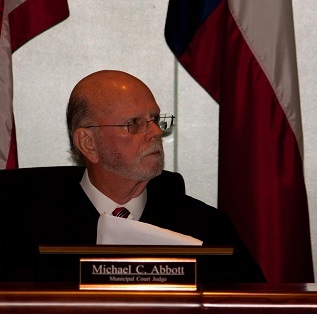 Municipal courts are Texas trial courts and the prosecutor represents the State and you represent the Defense. You (or your attorney) will be expected to follow the rules of evidence and procedure just like the prosecutors. Yes, go to the Court lobby or send a signed letter/fax changing your plea to guilty or no contest. Taking a driving safety course (defensive driving / DSC) for dismissal. No, you will never be sentenced to jail due to an inability to pay based on your financial status. There are payment plan options, community service, and indigent procedures in place to help you discharge the fine/cost you owe to the Court. You are responsible for keeping the Court abreast of your financial situation, appearing as needed, and providing required paperwork. If you would like to know more about payment plan, see the payment plan section under the Fine/Citation Payments option in the top right of this page. If you are arrested on a warrant out of this Court, you will be faxed paperwork while you are in jail to enter a plea. If you enter a plea of guilty or no contest and choose to sit out your fines voluntarily, you will be given credit at a rate of $100.00 per day and released as time served. All cases will be time served concurrently. If you choose NOT to enter a plea, you will be brought to Court and if you enter a plea of guilty or no contest, you will receive jail credit at a rate of $100.00 per day for the time you spent in jail. All cases will receive concurrent credit. If you enter a plea of Not Guilty, any jail credit you are entitled to will be applied to the fine/cost if you are found guilty. If you are incarcerated in jail on another Court’s violations and wish to receive concurrent jail credit on violations in this Court, you must fax a request form to the Court while you are in jail, NOT after you have been released. This request will be given to the Judge and if approved, a hold will be placed and you will receive jail credit concurrently at a rate of $100.00 per day. Jail credit will start to accrue on the date the request is approved. This court had an active warrant out for your arrest during the time you were incarcerated in a correctional facility. You must make the request in writing and submit proof of your incarceration from the correctional facility. The proof must contain the dates you were incarcerated. The case you are requesting jail credit on must have had a warrant in this Court that was active during your dates of incarceration. Check the bottom of your citation and make sure Vidor Municipal Court is listed in the contact information. If you received a citation, we will ask for the citation number. It is located in the top right hand corner of your citation. If you have been filed on by complaint and did not receive a citation, we will need your name, date of birth, and driver’s license or identification number, if applicable. Call the Court office at (409) 769-7452. No, you will not be arrested on a warrant issued by this Court if you appear to take care of the warrant. You may, however, be arrested at any other time or location. Simply calling the Court or being added to the next available Court docket does NOT recall or place a warrant on hold. You need to contact the Court where the citation/violation was filed. Courts are not affiliated in any way. You cannot call the Vidor Municipal Court to inquire about a warrant you have in another Court. For information on warrants issued through the Vidor Municipal Court, you may contact the Court office at (409) 769-7452. Citations issued by a DPS trooper or Orange County deputy inside the city limits of the City of Vidor are typically filed with the Justice of the Peace for Orange County, Precinct 4. You will need to check the Court contact information on your citation to be sure. The telephone number for JP-4 is (409) 769-2284. Vidor Independent School District Police officers file with both the Vidor Municipal Court and Orange County Justice of the Peace Precinct 4. You will need to check the Court contact information on the bottom of the citation to determine which Court the citation has been filed with and call the number listed. In most cases you can pay your citation online or over the telephone. Go to www.vidorpayments.com or call 1-800-444-1187 and be sure you read the information under 'full payments' completely to make sure you are eligible to make your payment. Partial payments cannot be made without prior permission form the Court.